Construction of a contentious section of the southwest Calgary ring road on Tsuut'ina lands west of the city has been halted while Alberta's Environmental Appeals Board considers a complaint that an earthen-berm crossing of the Elbow River should be redesigned. The ring road has been plagued with delays and opposition for years, but earlier in 2017 construction crews finally started work on the project that will connect Highway 8 to Highway 22X. The $1.4-billion project hit its latest speed bump on Saturday just after KGL Construction received the go-ahead to start work on a segment of road over the Elbow River. In response to a complaint filed at 5 p.m. Friday by Calgary resident Jeff Brookman, the Environmental Appeals Board placed a stay on construction. 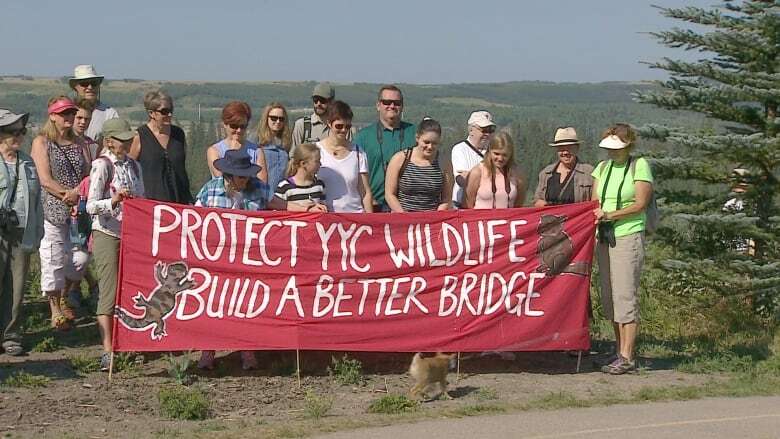 Members of the group YYC Cares, which helped file the complaint, say construction of the berm crossing — and related work to re-route the river and fill over some wetlands — will irreparably harm an environmentally sensitive area between Highway 8 (Glenmore Trail) and Highway 22X, including some 24 wetlands. "Those 24 wetlands are significant for flood mitigation. They're our best defence against floods. They're critical to the animal corridor," said group member Allie Tulick. The group has been calling for the proposed crossing to be re-configured as an open span bridge, which would allow water to pass under the freeway unrestricted. "The bridge that they're building is essentially a berm. The problem with that is it essentially dams the valley," Tulick said on The Calgary Eyeopener on Monday. "It's also a bigger concern for Calgary, because in the future, if something goes wrong with this berm and we do have a very horrible flooding event, and it gets wiped out, there's lots of consequences for the reservoir, which is Calgary's drinking water." Transportation Minister Brian Mason has stood by the current design, saying it is environmentally sound and will pose no problems for the Glenmore Reservoir or dam, even under flood levels as severe as those seen in 2013. Members of YYC Cares also held a protest at the construction site last month, focusing on a popular beaver pond they say will be damaged or destroyed by the work. EAB spokesperson Gilbert Van Nes says the board will look at whether the person who filed the appeal is directly affected and will have to make a decision quickly. "If he isn't directly affected, the board doesn't have the jurisdiction, the authority, to hear his appeal, and if we were to decide that, I don't know what the board will decide, we'd have to stop the appeal and lift the stay," he said. "Alternatively, if the board decides Mr. Brookman is directly affected, that this work is impacting him personally, his use and enjoyment of the environment, then the board would proceed with the appeal but we would still have to decide whether to keep the stay in place." According to Van Nes, one of the comments from KGL is that suspending work is costing a lot of time and money, which the board will also be looking into as part of its investigation. The $1.42-billion southwest ring road project will link Highway 8 with Highway 22X and is slated to be completed in the fall of 2021. Under the terms of the agreement that the province has with the Tsuut'ina Nation, the ring road must be completed by May 2022 or the land purchased by the province from the nation will revert back to the Tsuut'ina.